Dictionary.com defines synchronicity as a "coincidence of events that seem to be meaningfully related". So unlike your average, run of the mill coincidence, synchronicity suggests some greater purpose propels the merging of experience. I first learned the word from an elderly woman who befriended me a few years ago when I was living as a tired eyed, intensely-in-my-head graduate student in York, England. She was a spark of magic in my too serious world and her introduction of this concept--synchronicity--struck me as magical, too. Recently, I've decided to take up an art project. I've been tossing around ideas and am drawn to themes of wrapping and unwrapping, offerings, and memory. In my brainstorming these last few weeks, I kept envisioning this delicate book-cut sculpture by Su Blackwell I saw at the Birmingham Art Museum in England when I was first learning about synchronicity. I loved the piece so much I wrote the title of the work and the artist in my notebook. A few weeks later I lost my notebook on the train and, sadly, my reference. I have been haunted by this piece lately as it seemed important for my own creating. 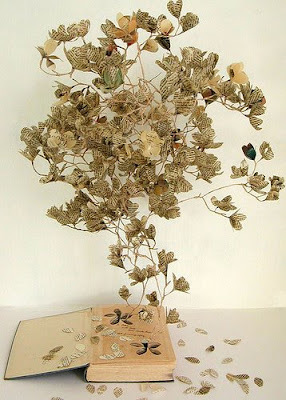 This morning, while blog surfing, I linked to the Transpacific Sketch Project and lo and behold: Blackwell's book-cut! The artist and her piece have come back to me just when I needed them. I love this kind of merging--the way in which things come together in a small, quiet and magical unfolding.